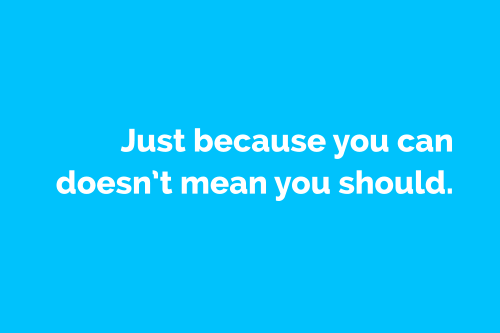 You are so right, just because you can doesn’t mean that you should. I’ve been in an administrative role for all of my adult life. I’ve amassed a wide skill set because I try to be so many things for my clients. If there is something I don’t know, I’ll learn it and inevitably I take on more and more. I have been victim to my doing so. I do more for my clients than I really want to, I’m burned out and have accepted that things have to change. I’ve been living to work rather that working to live. Zeroing in on what I want to do has been intimidating because I know that it can and will substantially change my client engagement. However, I know that I can’t be everything to everyone and trying to do so inevitably means that I am so tired that I can’t sharpen my skill set or specialize in the things that really interest me. I’m guilty of hitting the wall of overwhelm and living there. The hamster wheel is real. Then too, I personally struggle with self-esteem issues in my personal life and had thought that it didn’t bleed into my professional life. Naive, I know, but that’s what I thought. Indeed, I have only determined at a macro level my target market and as you and I discussed, it doesn’t allow for growth or becoming an expert in a niche (or two). And now I must give my clients a new playbook so that I can have the time and energy to do what I really want to do, er, whatever that is, LOL. Because I have grown up and subscribed to the employer/employee relationship it is not a surprise that I have run my business like I’m an employee and not the boss. It’s like you were speaking directly to me! Thank you so much for all that you do. You are my mentor and I am a full and true believer in your processes. It’s such a pleasure to read your wise words. Thx! So true. I’m trying to figure out what my specialty is. Are you in the administrative support business? If so, that is your specialty. What you may need is a target market. That’s what I meant. Thanks. And great site. LaToya Davidson-Perez, it’s hard because of my many interests. One day I’ll have to sit down and write it out. If I may offer some advice… writing down your list of many interests isn’t what is going to help you figure this out. First you need to choose a field/industry/profession to focus on (my free target market guide walks you through a process of narrowing that down). Then you look at what THEY do in that field/profession/business, what THEIR interests are, how THEIR business works, and what work is involved in running it. That is what is going to help you devise your admin support offerings to them, more easily, clearly and specifically, which in turn is going to help you create a much more compelling marketing message to them. Danielle Keister, thank you. I’ll download the guide. Adrienne B., I’m exactly the same way. I’m just now, and with Danielle Keister’s help, starting to narrow my scope. I’m a Jane of All Trades and Master of None. I’m fortunate to have a large skillset but I can’t keep up with all of them. Things change so quickly and something that I was once an expert on, I’m now just a generalist. Plus, I haven’t had or made the time to keep up on the things that I really love since my entire working day is spent catering to my clients. Danielle has a mantra which she states in the “Power Productivity & Business Management.” “I take great care of MY business first so that I can take fabulous care of YOU and your business.” Reading her blogs and her system has been mind-blowing and such a great resource for getting out of the employee mentality. Exactly, LaToya. 🙂 It’s not “skills” per se that you want to be an expert in; it’s the target market. Once you decide on who that is, you’ll then know what work and skillsets are relevant and what aren’t. I want to add this as well… After a a certain point, once you’ve recognized you have a problem client who wants to run your business the way THEY want instead of how you do things and it’s creating difficulty for you in your business, that’s when you have to step back and have a very pointed conversation with that client. This conversation doesn’t need elaborate explanation or rationalizing or “convincing.” It simply needs to be, “This is how I run my business and how I work with clients. If you aren’t able to work with those policies/protocols/procedures/parameters, it may be time for us to re-evaluate our relationship and decide whether are still a fit for each other/should continue working together.” They will either get with the program or do you a favor and end the relationship. Or, you can choose to end it yourself. It’s all up to you. However you decide to handle things, I guarantee you, once you zap those things who are creating a de-energizing drag in your business, you’ll feel the weight of a hundred buildings lifted from your shoulders.